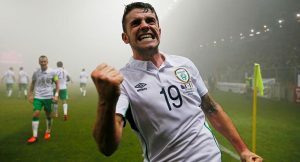 You are here: Home / Articles / Robbie Brady being tracked by Swans? Robbie Brady being tracked by Swans? If reports in the Norfolk based newspaper the Eastern Daily Press are anything to go by, then the Swans are tracking Norwich City left-back/winger Robbie Brady. The 24-year-old Irishman, who starred for the Republic of Ireland in Euro 2016, is being tracked by a host of Premier League and Championship clubs, whom are keen to bolster their squads in the January transfer window. Brady has no shortage of admirers due to being able to play as a winger or left-back and despite the Daily Mirror reporting that Norwich has put a £12m valuation on the Irishman last weekend, there is still interest from the Swans, along with Premier League rivals Leciester City, Burnley and Crystal Palace. Palace are already rumoured to have tabled a £7m bid for the Irishman over the last couple of days. With the Canaries own promotion hopes seemingly flagging, the Carrow Road hierarchy could well be tempted to cash-in and use the money to bolster their promotion push, especially as Aston Villa and Newcastle United are also thought to be pursuing the talented International. The versatile left-sided player, already capped 31 times by his cvountry, signed a three-year deal with the Canaries, with an additional one year option, when he moved from relegated Hull City in 2015. It is unlikely that the Swans would want to splash £12m on a player such as Brady, but given the pressing need to bolster their rearguard it remains a possibility. Swansea pay £12 million for a left back? Pull the other one.